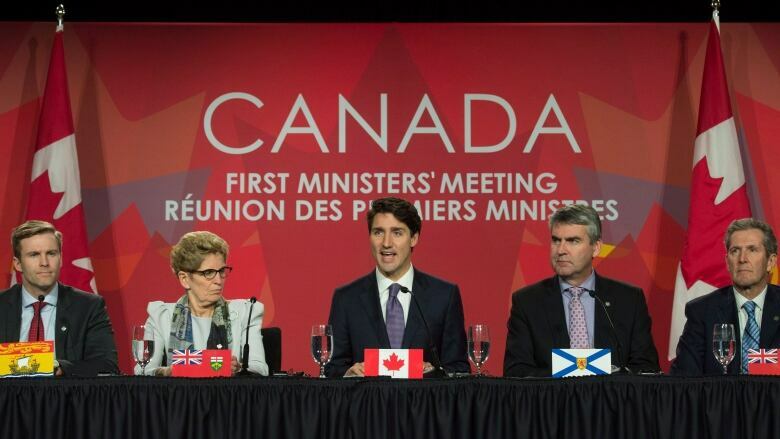 Friday night, Justin Trudeau was able to appear on stage with the premiers and declare himself "very happy" to have general agreement on a pan-Canadian framework deal on climate change. But that means there's still lots of talking to be done. "We're not there yet," said Christy Clark, premier of British Columbia. Clark had appeared suddenly before reporters at about quarter to six on Friday evening, right around the time premiers and the prime minister had been expected to announce the sort of national plan on climate change that has eluded this country for nearly 30 years. Saskatchewan's Brad Wall had already made it clear he would not sign any deal that included anything to do with imposing a price on carbon. But opposition from Clark, and Manitoba's Brian Pallister, was more surprising. The B.C. 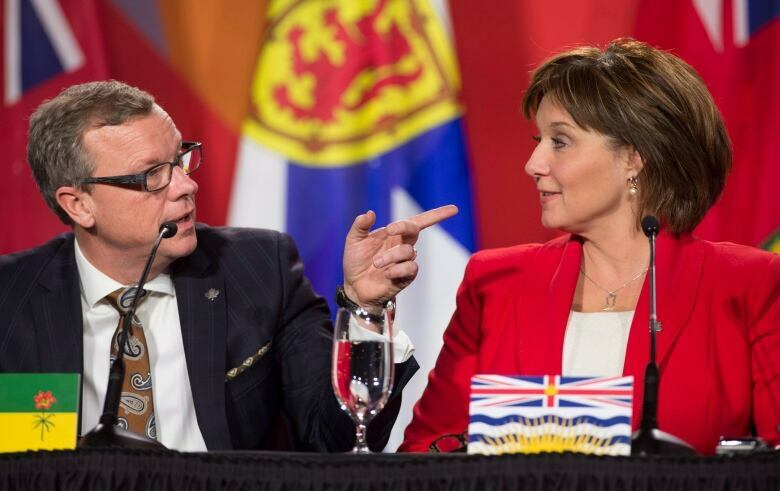 premier told reporters Friday morning she had concerns about how equivalency would be measured and ensured across the different provincial systems for pricing carbon. And then she emerged to declare an impasse. But at that very moment, as Clark seemed to be upsetting the scene, officials from the federal government and British Columbia were apparently getting to "there." In response to Clark's concerns, the final agreement would include a report on provincial pricing initiatives in 2020, the year B.C. 's current carbon price of $30 per tonne would be required to rise according to the federal government's prescribed schedule. Only moments after B.C. seemed to be out, word came back to reporters that it was in. There would still be some debate about what might happen in 2020 if British Columbia decides it shouldn't have to go above $30. But an hour after Clark's dramatic announcement, Trudeau was able to appear on stage in a crowded theatre and declare himself "very happy" to have general agreement on a Pan-Canadian Framework on Clean Growth and Climate. Having already become the fourth prime minister to commit his country to reducing its greenhouse gas emissions, Trudeau has now gotten further than any in explaining how Canada might actually do that. Twenty-eight years after the first commitment, there is something like a plan. Friday's final communiqué includes one footnote, in italics: Saskatchewan is not adopting the Pan-Canadian Framework. Manitoba's reluctance is not so prominently declared. Premier Brian Pallister came to Friday's gathering at Ottawa's old city hall wanting to talk about federal funding for health care, and he wasn't the only premier to raise the issue during the afternoon session. But Trudeau insisted on keeping the discussion focused on climate change, having earlier agreed to discuss health care at a working dinner following the meeting. But with no new commitment to additional funding, Pallister declined to commit to the climate framework. 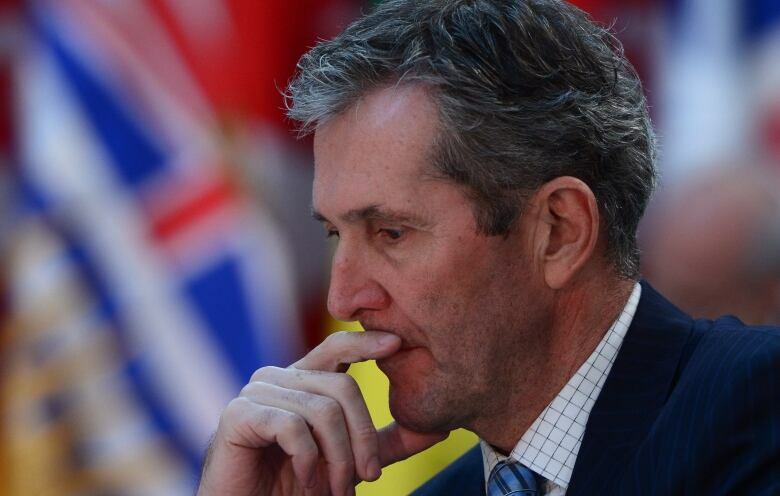 That might be resolved at some future date — Pallister has at least already committed to implementing a price on carbon. Saskatchewan Premier Brad Wall, meanwhile, seems prepared to remain in objection to the end: destined to be remembered as either a noble voice of reason who was eventually proven right or as one who stood before progress yelling stop. Despite having introduced legislation in 2009 to impose a levy on heavy emitters and having recently said he is still willing to do so at some point, he said that 2018 would not be the right time for a carbon tax. At the closing news conference, Wall repeated his threat to pursue legal recourse against any federal imposition of a carbon price. 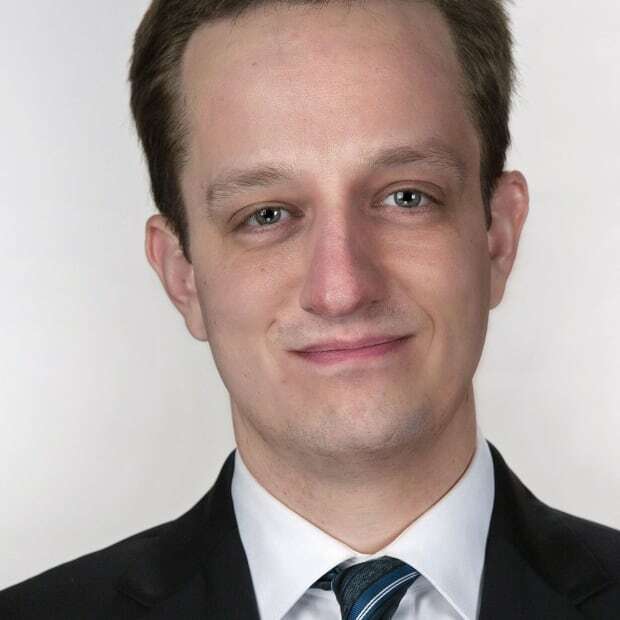 He and Trudeau sparred openly over the implications for farmers, the economics of pricing carbon and the ramifications of Donald Trump's presidency. "I think all Canadians know that Canadian climate policy will be set by Canadians, not by whoever happens to be the president of the United States," Trudeau declared, after Wall had finished surveying the position of the incoming U.S. administration. At another point, Trudeau, who sat up straight, leaned forward in his seat and surveyed the room with a satisfied look on his face as the news conference proceeded, interjected to posit that, "Everyone was facing challenges. Everyone has particular circumstances within their jurisdiction. And what animated all of us, today, every single one of us on this stage, is a desire to do the right thing for our kids and grandkids." McKenna said this was about a "better future for our children." Perry Bellegarde, national chief of the Assembly of First Nations, said "this is about our children and grandchildren and seven generations down the road." "It matters a lot to our grandchildren, how quickly we get to the place we have to get," said Joe Biden, the American vice-president, making an odd guest appearance earlier in the day. But regardless of whether the current generation manages to spare their progeny the worst impacts of climate change, future Canadians will probably still have to contend with federalism. Which is to say that nothing will ever be easy. Even if it seems to be of the utmost importance. Side deals on coal-fired electricity have already been made with Saskatchewan and Nova Scotia. Clark's gambit on pricing hints at difficult conversations to come. And all of the leaders who have agreed to this framework will eventually face re-election — most notably, Alberta's Rachel Notley and Trudeau himself in 2019. Of course, it might also be noted that 50 years after the birth of national medicare, it is still being contested over working dinners. On climate change, there is a framework. But now it must be filled in with policies and actions. Any of which could be difficult or lead to mistakes. In his pep talk Friday morning, Biden ventured that international movement on climate change was now "unstoppable." That might even be true. But it doesn't mean that the inevitable will go smoothly. "This is a great day for Canada," Trudeau said Friday night, then thumping the table in front of him with an open hand, and ending the news conference after Wall's last lament. The events of Friday suggest there is still a ways to go.